I'm a happily married, fiftysomething woman with 2 grown children, 1 daughter-in-law and 1 grandson. I love making jewelry, mostly simple designs. I also like to make keychains and bookmarks and a few other items. I have Lupus and in the last year or so the joints in hands have been more affected, so I don't create as much jewelry as I once did. Currently I am selling what I have left and anything I can manage to make. I am also selling items from my Mother's estate and miscellaneous items from around my house. 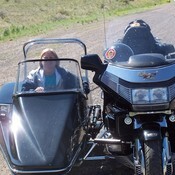 Besides my jewelry making, I like to promote Lupus Awareness, Promote Help for the Hungry, work on my family genealogy, read, and when I'm feeling really good ride on the motorcycle with my husband and enjoy my grandson. sidewingcreations doesn't have any items in their booth! You will enjoy your shopping experience at Sidewing Creations. Such a friendly, helpful shop owner who provides wonderful, well-priced items – many of them handcrafted by herself- and excellent customer service! I have enjoyed every minute of knowing Wendy/SidewingCreations here on Bonanza and am honored to have her as a friend! Such a Wonderful Bonanza Seller!! Such a Sweet and Caring Lady!! Quite a gal maintains this booth. She has some really great items offered. Check it out.I’m sure you’ll agree and join me as a buyer/supporter of sidewingcreations. This is an awesome Bonanzler, you can’t wrong doing business in this booth!! You can’t go wrong buying from this awesome Bonanzler. Great Communication and wonderful items. Always takes time to help anyone. An asset to Bonanzle as a Seller or Buyer. Nice to meet you. Wish you a good sales here. Very nice person, and great booth! Just added to my favorites! Great shop! Items are made with quality and attention to detail, and at great prices!! Good luck to you!